Great layout of new durable materials for modern lifestyle. This average sized housing estate garden enjoyed very limited sun, had drainage issues and the client was very uninspired about what to do with their space and what it was worth spending to create a nice garden. This is a regular scenario for me and I spent a lot of time with the client looking at ideas, possibilities and accurate likely costs of various designs, details and materials. With an experienced and accurate discussion about the pros and cons of various designs and choices I guided the client through the possibilities to a design that really suited them and they were thrilled. 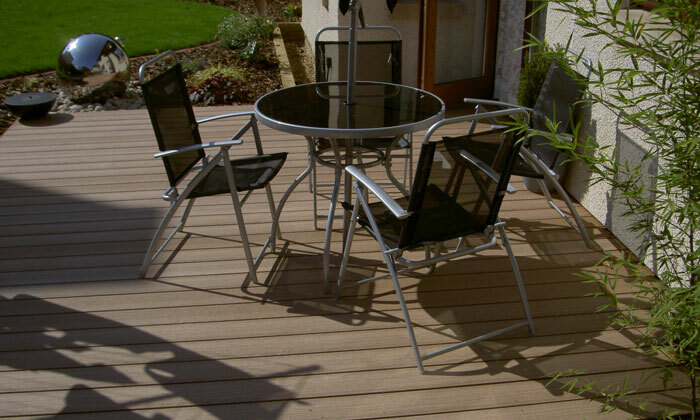 A good sized sunny deck area outdoor room was created outside their kitchen and the garden swept all around that main feature with carefully designed and discreet drainage solutions. Using some new generation materials, hidden walling and simple focal point features the end result was a very finished detail to suit their budget and modern lifestyle aspirations.